Daniel Ricciardo qualified fourth and Daniil Kvyat fifth, but the four-time world championship squad could do nothing to resists its cars slipping down the order at the hands of Ferrari, Williams, and even its junior sister team Toro Rosso. Most frustrating was the latter of those teams, which is running the same Renault engine Red Bull Racing has spent the last fortnight claiming is the root of all its problems. With the ability to blame the engine greatly diminished, and with the sport putting on a thrilling show to neutralise the team’s calls for performance equalisation, Red Bull Racing was left with significant soul searching to do post-race. “It was a very tough afternoon,” said team principal Christian Horner. “After the start, Daniel seemed to be going okay pulling away from the Williams and fitting into a gap on the back of Rosberg. “Then the safety car came out and we pitted both cars. We effectively made a place because we jumped Rosberg with Ricciardo and we didn’t drop any places with Kvyat. “But as soon as we started to run into traffic, temperatures started to get out of control, especially when it came to managing the brakes. “We really didn’t have any pace. It was an afternoon of trying to manage our way through the second half the race to make sure we got to the end. Despite Red Bull’s upbeat attitude after its promising qualifying session, Horner admitted the rain merely masked some of the RB11’s deficiencies, with the hot weather inversely illustrating them in full. Of greatest concern for the team was the stress the car was putting on the brakes, which were shedding significant quantities of black brake dust throughout the race. Worryingly, Horner said the issue hadn’t been anticipated, nor its cause understood. “We don’t really know,” he admitted. “We were managing the situation with the brakes — there was quite a lot of brake dust coming out from early on — and we were concerned at one stage that we wouldn’t get to the end of the race. “It was a question of damage limitation, of managing our way to the end of the race. Daniel Ricciardo was similarly downbeat at the end of the race, admitting he got little enjoyment from driving the car. “Not really fun — I probably had high hopes coming into the race and I was ready for a fight to try to do something special,” said the Australian. “But the race was anything but special. 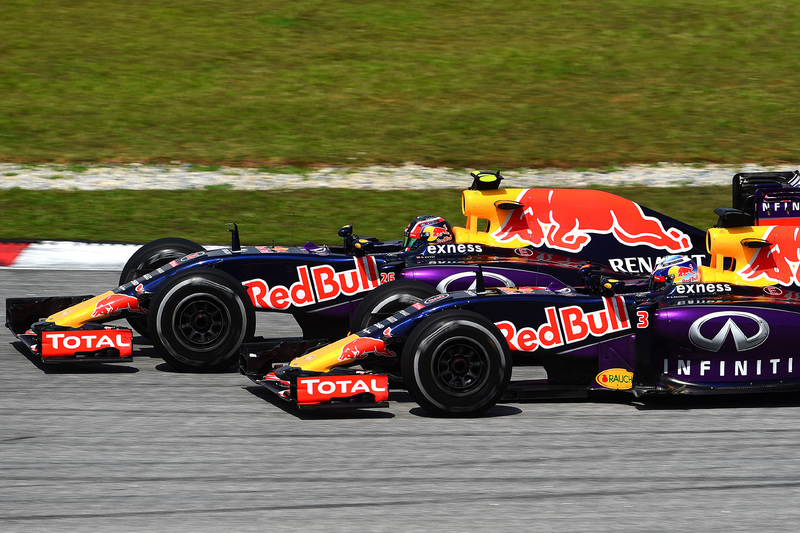 Ricciardo finished tenth to take home a solitary point after a race of backwards movement. After the team decided not to replace a front wing damaged in a first corner incident, Ricciardo was swamped by his teammate and Toro Rosso’s Carlos Sainz, and didn’t have the pace in his car to make up any further ground. “We damaged the front wing a bit on the first lap, which I think hurt us somewhat, and there was quite a bit going on with the brakes. We couldn’t really look after the tyres that well. “I think with the other issues we had they were hurting our driving style. “It wasn’t exciting. I just felt helpless, to be honest. I feel like I came in fired up and ready to go, but it was hard to put up a fight today.